Jerusalem has been under assault. The attack that began at Camp David on the veracity of its biblical past was only a prelude for compromising its political future. In Western diplomatic circles, including in the U.S., it is now being argued that by pushing hard for a Middle East settlement, with the redivision of Jerusalem at its core, the flames of radical Islamic rage will be lowered. Yet as this groundbreaking study shows, the exact opposite is true. 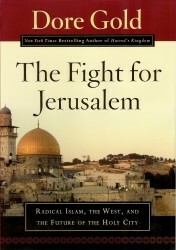 In The Fight for Jerusalem, former Israeli ambassador Dore Gold argues that if Jerusalem is to be a free city where all faiths can be practiced, it will have to remain under Israeli sovereignty, because the United Nations is untrustworthy and the increasingly radical Muslim Palestinians are looking to obliterate other faiths from Jerusalem, not tolerate them. Why turning over part or all of Jerusalem to the Palestinians would be tantamount to turning it over to the Taliban. How Palestinians are destroying archaeological evidence of the ancient Jewish presence in Jerusalem, particularly on the Temple Mount. How Western diplomatic concessions feed wild apocalyptic speculations of radical Muslims-and how the Israeli withdrawal from Gaza strengthened Palestinian extremists, not moderates. How radical Muslims are making common cause with biblical skeptics to deny Old Testament history-and how the latest archaeological findings in Jerusalem confirm the historical truth of the Bible. How the League of Nations Mandate for Palestine didn’t create a new right of the Jews to settle in Palestine-it acknowledged their pre-existing right to do so. The role of radical Islam in the “intifada” against Israel. Why any future negotiations between Israel and the Palestinian Authority over the status of Jerusalem have very little chance of producing an agreement. The Fight for Jerusalem is not a publication of the Jerusalem Center for Public Affairs, but rather is produced by Regnery Publishing, Inc., an Eagle Publishing Company.